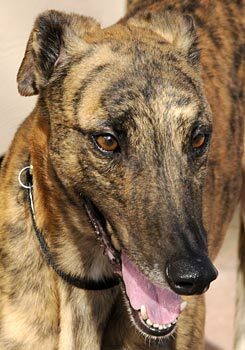 Slim Jim is a 4½-year-old brindle male born October 2004. His registration ear has been doubled tattooed, so his true identity will never be known. Slim Jim was found by the Waco Animal Patrol in the yard of an abandoned house. It is not known how long Slim Jim was alone, or if he was dumped off. At that time, he was very thin, but has blossomed under the care of Dr. Christy Soileau of VCA Preston Park Animal Hospital and his wonderful foster home. He is now ready to find his forever home. Slim Jim is a shy boy. Slim Jim’s cat test: Slim Jim passed his test. He showed no interested in the cats, but is also very shy. He’s been in his foster home long enough to be used to a home environment, however, so it’s not like he was too new to tell what he might be like in a few weeks. We did get him to look at them. Domino played and jumped around after a laser light toy, so Slim also got to watch a cat during high activity. Zero interest. He is also small dog tolerant. 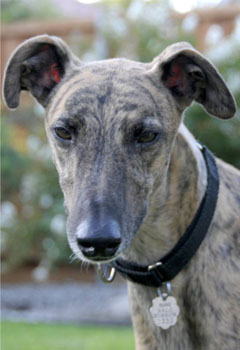 Slim Jim is a robber - a sweet, well-mannered boy who will steal your heart away. Despite his shy nature, Slim has adapted quite well to a foster home that opened its doors a few months ago to Katie Anne and her brood of seven lively puppies. The puppies are all gone now - happy in their new foster or forever homes - but Katie Anne is still around to keep Slim company. 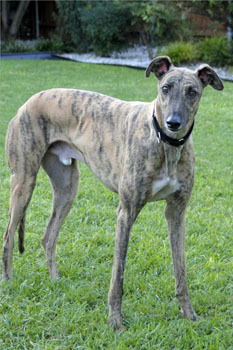 Slim is an easy-going, cat-tolerant boy who gets along greyt with his other roommates - a standard poodle, a doberman, and two female greys. If you love a leaner who handles well on the leash and never jumps up on people or furniture, then Slim Jim is the guy for you. I suspect that he is an Emily Post graduate, because his manners are impeccable! He has a healthy appetite and spends a lot of time in his crate when I'm gone during the day. Slim Jim seems to love this nice, safe spot - but his favorite place is on his dog pillow, next to your own bed at night. Slim may be a little shy when he first meets you, but once he gets to know you, he'll charm your socks off!